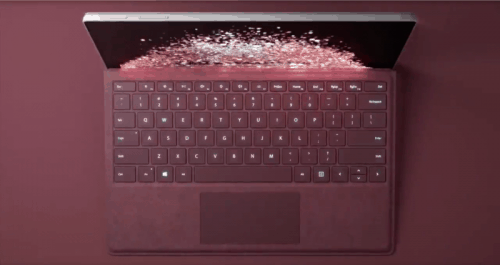 Microsoft has announced an upgraded iteration of its original Surface Pro lineup without any numbering with many “meaningful” changes. The successor to 2015’s Pro 4 packs 800 custom new parts with a lot of iterative hardware and software changes. Though the new device looks quite similar to its predecessor but its lighter and thinner with massive 13.5 hours of battery life, a new silent fanless option, improvement to the pen and faster processing. “This is a powerhouse laptop with 2.5 times more computing performance than the Surface Pro 3 and 1.7 times the compute [power] of the iPad Pro,” the company notes in its official blog post. With a more flexible and bendable hinge, the new Surface Pro has been inspired by the company’s huge Surface Studio touchscreen computer, designed for creatives and it now has a full 165-degree range of motion. The laptop weighs barely 1.7lbs and is 8.5mm thin. Then there is 12.3-inch PixelSense Display, which the Redmond giant says has about 50 percent more pixels than the MacBook in the same range. A custom silicon chip has been integrated into the device and it enhances colours displayed on this 267 ppi and 3:2 aspect ratio screen. This is coupled with advanced LTE, a very significant choice for the upgrade. It even supports the latest Windows Ink, Office improvements, and the beautiful Surface Dial. In the photos department, the perimeter vent has shrunk a little around the device so it’s no longer so noticeable, and the device has rounded edges that make it feel better when you’re holding it as a tablet. Notably, Surface Pen won’t come in the box this time, so you’ll have to purchase it separately for $99. While it will work on existing devices, a new tilt functionality is only available on the Surface Pro for now. Tilt will detect the angle of the pen to enable shading and better accuracy for inking. The device is available for preorder today starting at $799 but you will have to shell out another $129 (minimum) for a Type cover and $99 for the new Surface Pen.